This Settelement or Compromise Agreement is for use when an employer wants to ensure that an employee who is leaving on agreed terms cannot then bring a claim at court against the employer. Five Schedules cover the adviser’s certificate in relation to employee agreements and warranties, calculation of the statutory redundancy payment, employee reference, announcement and post-termination restrictions. You need this document if you are a company looking for an agreement which allows you to avoid a former employee bringing a court claim against you as his/her employer after leaving on agreed terms. The long form settlement agreement is suited for a senior or director level employee. A settlement agreement is used when an employer wants to ensure that, when leaving their employ, an employee cannot then bring a claim at court against them. The settlement agreement is traditionally used to settle disputes with a bad leaver and should in this case mention any specific claim that is in action that is being settled. Alternatively, employers may want to pay a good leaver compensation as a goodwill gesture and formalising that arrangement within a settlement agreement has become a standard way of doing this, although strictly speaking it is arguable that in this case it may not be binding. If in doubt, please seek legal advice. Consideration is of course necessary for all contracts and, whether good or bad leaver, the employee will need to be satisfied that they are being paid enough to sign away their statutory rights. • The agreement must be in writing. • The agreement must relate to a “particular complaint” or “particular proceedings” (clause 3.5). • The employee must have received legal advice from a relevant independent adviser on the terms and effect of the proposed agreement and its effect on the employee’s ability to pursue any rights before an employment tribunal (clause 7). • The independent adviser must have a current contract of insurance, or professional indemnity insurance, covering the risk of a claim against them by the employee in respect of the advice (clause 7). • The agreement must identify the adviser (clause 7). • The agreement must state that the conditions regulating settlement agreements have been satisfied (clause 16 and Schedule 1). Please note that text within square brackets and/or italicized will require amendment to ensure that it matches the requirements of individual employers. The agreement is titled “Without Prejudice and subject to contract”, which must be removed or crossed out before it is signed. Notice provisions in clause 2.5 of the contract will be relevant as to whether payment in lieu of notice can be made at all and furthermore in some circumstances whether it can be paid free of tax. In some cases, notice periods may even be longer than those stipulated in the employment contract for senior employees. This will contain all payments made to the employee, contractual, statutory (if applicable) and compensatory. An employee is entitled to notice and accrued but untaken holidays on termination. A statutory redundancy payment can be included if the employee is being made redundant. A compensation payment will usually be tax free up to £30,000. In clause 3.5, case law dictates that it is advisable to list all possible claims. If you do not list one particular claim, then an employee may still have a right to bring that claim, hence the tradition of making an exhaustive list. 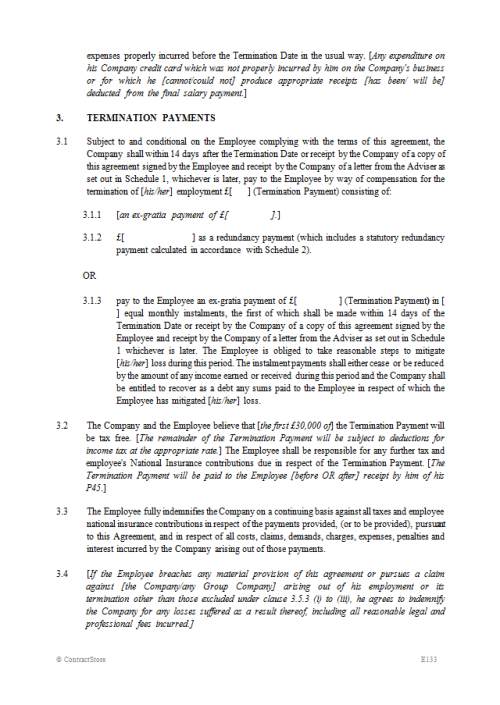 The clause also has provision for repayment of certain of the amounts if the employee breaches the terms of the agreement. As above, this will require amendment to ensure that it matches the requirements of individual employers. Please read the pension requirements to see if the employee can have their pension transferred to them personally. As above, this will require amendment to ensure that it matches the requirements of individual employers. The amount of benefit that normally accrued to the employee referable to the car will normally be taken into account when calculating any compensation. This does not have to be offered. Sometimes employees want it. Sometimes they would rather have the equivalent cost in cash. This is the crux of the agreement, in conjunction with clause 3.5, agreeing that the employee has no claims and will make no claims against the Company. In clause 7.2 the Adviser must be an independent legal adviser chosen by the Employee. The Company can suggest firms but cannot recommend any. Clause 7.5 is a one way non-disparagement clause. Some parties will negotiate for this to be two-way. For larger companies, it is advisable to use “reasonable endeavours” only for non- disparagement as it is almost impossible to police all employees. The employer does not have to provide a reference but it will usually figure in the termination negotiations. The reference can be a simple list of how long the employee worked at the Company and what their job title was or it can be as complicated as the Company likes. As above, this will require amendment to ensure that it matches the requirements of individual employers. It will only apply if a senior level registered director is being terminated, which is the normal level of employee suited to this type of agreement. As above, this will require amendment to ensure that it matches the requirements of individual employers. It will only apply if the employee has been on garden leave. 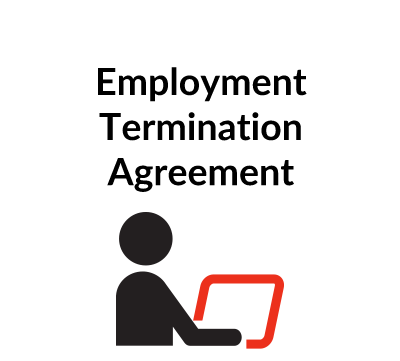 In clause 11, whether to include post termination restrictions in the Settlement Agreement or not will depend on whether they are already agreed in an employment contract and/ or whether they are adequate. Separate consideration should be provided for any fresh covenants since payments for restrictive covenants are taxable in full and liable to NICs. If a specific sum is not carved out then HMRC may argue that the whole termination payment is consideration for the restrictive covenants and taxable in full. It is usually only around £100 (or can be less) and usually employers will reduce the compensation payment by this amount. Clause 12 will apply only if the Settlement Agreement is settling proceedings in progress. The clause should list all the details of case number, issue date and tribunal that it is being heard in. It is not a statutory requirement to pay legal fees for the Employee but it is customary and acts as a “sweetener”. Customarily, for more junior employees, this can be anything from £250 – £1000 plus VAT or for more senior employees £500 – £1500 plus VAT. The Employee’s solicitor may try to negotiate on fees. This is one of the mandatory clauses in a settlement agreement. Settlement agreements and the conditions of entering into them, are referred to in various statutes and this clause will satisfy that all those statutory definitions have been satisfied. This clause may need to be updated in the event of a change in relevant employment law. These are general wrap up clauses, which speak for themselves. 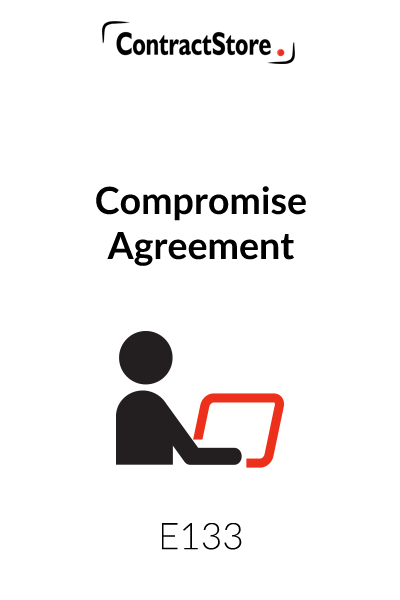 An entire agreement is used in most full contracts. In brief it means that only the terms of this agreement will apply and any agreements, whether oral or in writing, that have taken place outside of its confines, will not apply. The Execution Clause: this is sets out in the form of a Deed. The Settlement Agreement does not strictly speaking have to be signed as a Deed and legal advice should be taken as to when this will be necessary, if at all. Generally, if consideration in the form of a compensation payment is being given, then a normal, non-witnessed execution will be sufficient. This will be handed by the employee to the independent adviser, who will fill it in and send it with the signed document, to the Company. Alternatively, the independent adviser can sign and send this first or send to the employee to deal with the documents. Statutory Redundancy payments will only kick in for employees who have served two full years of employment. A ready reckoner can be found on the government’s trade and industry website (currently DirectGov). As above, a standard template reference is attached. However, this can be negotiated in any form that the Company and Employee wish. There are no statutory conditions regarding what should be contained in a reference and many companies wish to keep it limited to dates, position and reason for leaving, with the recommended disclaimer. Please take legal advice as to what periods and other restrictions will be enforceable for the particular situation.